The Mr Holmes story is set in 1947, following a long-retired Sherlock Holmes (Ian McKellan) living in a Sussex village with his housekeeper and rising detective son. But then he finds himself haunted by an unsolved 50-year old case. Mr Holmes memory isn’t what it used to be, so he only remembers fragments of the case: a confrontation with an angry husband, a secret bond with his beautiful but unstable wife. 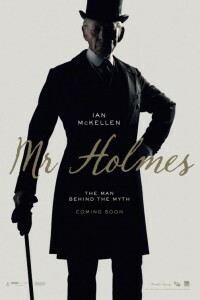 The movie Mr Holmes is directed by Bill Condon, who is responsible for the final two Twilight movies, as well as the movies Dreamgirls and Gods And Monsters, the latter which also stars Ian McKellan.